Are you worried about high cholesterol? Are you eating a heart healthy diet? Cholesterol has many biological functions: it metabolizes and aids in the absorption of fat and fat-soluble vitamins (A, D, E, and K), is a precursor for several hormones, and is a major component of the cell membrane. Cholesterol is transported to your cells through the bloodstream. If too much low-density lipoprotein (LDL, or “bad cholesterol”) is produced, it can build up on your artery walls. This narrows the passage of blood flow, putting you at higher risk of a heart attack or stroke. Foods that are known to contribute to increased cholesterol levels are those that contain high levels of saturated and trans fats, also known as the “bad fats.” Our body synthesizes cholesterol from these fats; therefore, a diet high in saturated and trans fats leads to high LDL levels. High cholesterol has been associated with an increased risk of coronary heart disease and stroke. There is a common misconception that foods high in cholesterol are the main cause of the increased risk. For instance, one large egg contains about 190 milligrams (mg) of cholesterol; however, in a meta-analysis evaluating egg consumption and risk of coronary heart disease and stroke, researchers found that there was no association. Therefore, there are no current guidelines limiting dietary intake of eggs, although you’ve probably seen people who are watching their cholesterol levels refuse to eat eggs or only eat egg whites (diabetics, however, should limit their intake to four egg yolks per week). Having high cholesterol can be managed or prevented through your diet. By making healthier dietary changes and avoiding the following five foods, you are well on your way to protecting yourself from heart disease and stroke. Although potatoes contain trace amounts of fat, the concern is what is mixed into them. Mashed potatoes are often combined with a large quantity of butter and cream to give it a creamy rich texture and taste, which loads them with plenty of saturated fats. Consider skipping the butter and adding low fat milk (below two percent) or enjoy baked or sweet potato chips. Slice the potatoes, drizzle with vegetable oil, and sprinkle with rosemary. Bake them at 350°F for 15–20 minutes. 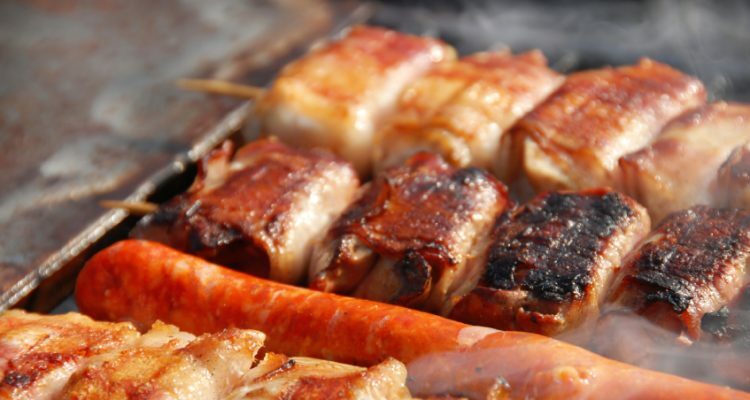 With BBQ season just around the corner, people tend to overindulge in highly processed fatty meats that are full of saturated fats. Avoid processed meats such as salami, hot dogs, frankfurters, pork chops, and marbled meat. Limit your intake of red meat to no more than 18 oz. per week. Consider using leaner cuts, with limited marbling. Also, leaner proteins, such as poultry and fish, are great alternatives to make sure you are meeting your nutrient needs while keeping your cholesterol levels in check! Oils are generally the types of fats that you’re encouraged to consume. These are often abundant in polyunsaturated fats, which are good fats. However, “tropical oils,” which include palm, palm kernel, and coconut oil, are mostly comprised of saturated fats, so their intakes should be consumed in moderation. These oils are used in cooking and baking. Baked goods do not provide many nutrients and are high in empty calories. We all have a sweet tooth and may indulge once in a while, but be wary of what you are putting into your body. Many baked goods use ingredients high in saturated and trans fats such as butter, lard, or shortening. These can be easily replaced with vegetable oil or even a fruit purée, such as apple sauce, bananas, or avocados. Consider replacing half of the white flour with whole wheat and add some bran or flax to bulk up the fiber content. Remember: fiber helps lower your bad cholesterol! A typical cheese slice contains about 10 grams of fat and four grams of saturated fat. That’s nearly 30% of the maximum amount of saturated fat that should be consumed in a day. Your intake is likely not one slice of plain cheese pizza. Although pepperoni, bacon, and other processed meats might appeal to your taste buds, they are detrimental to your heart. The meat toppings are packed with saturated and trans fats. If you must indulge, try skipping the meat and loading up on the veggies. Read nutrition labels or ask for the nutrition facts. You can even make your own pizza. Use a whole wheat crust and low-fat cheese (<20% milk fat) and load it up with unlimited veggies! “Tropical Oils,” American Heart Association web site, September 28, 2010; http://www.heart.org/HEARTORG/GettingHealthy/FatsAndOils/Fats101/Tropical-Oils_UCM_306031_Article.jsp, last accessed May 27, 2013. “Know Your Fats,” American Heart Association web site, May 1, 2013; http://www.heart.org/HEARTORG/Conditions/Cholesterol/PreventionTreatmentofHighCholesterol/Know-Your-Fats_UCM_305628_Article.jsp, last accessed May 27, 2013. Fernandez, M.L., “Rethinking dietary cholesterol,” Current Opinion in Clinical Nutrition & Metabolic Care 2012; 15:117-121. Rong, Y., et al., “Egg consumption and risk of coronary heart disease and stroke: dose-response meta-analysis of prospective cohort studies,” BMJ 2013; 346:1-13. “USDA National Nutrient Database,” Agricultural Research Service, December 7, 2011; http://ndb.nal.usda.gov/ndb/search/list, last accessed May 19, 2013. Zelman, K.M., “9 Surprising Foods That May Raise Your Cholesterol,” WebMD web site, 2011; http://www.webmd.com/cholesterol-management/features/9-surprising-foods-that-may-raise-your-cholesterol, last accessed May 27, 2013.